Kayaks, SUP, Canoes, Bikes, Disc Golf! 4 Hour Gulf Islands National Park Reserve feature! We are a family owned and operated company in the heart of the Southern Gulf Islands of British Columbia, located at the hub of the Pender Islands, Port Browning Marina, offering a launch point for some of the best paddling around the Penders. 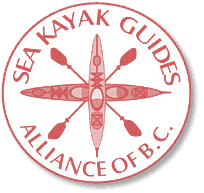 All our guides are members of the Sea Kayak Guide Alliance, BC.